The rich and tasty Tango Chocolate has the goodness of milk with the taste of real rich chocolate blended together to bring out a taste that is unforgettable. Introduced to the Indian markets in 95' Tango Chocolate gives the best value for money proposition in terms of quantity and quality. Our Tango Chocolate is known for its health benefits as well. 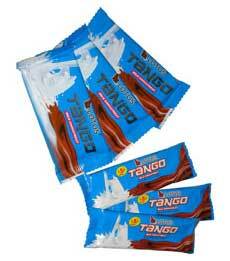 We provide our Tango Chocolate at competitive prices.